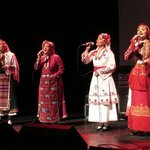 The Eva Quartet consists of some of the best Bulgarian female voices - the four young solo singers (after a strong selection from thousand applicants) of the world famous female folk choir "Le Mystere des Voix Bulgares". Here the different voices are meeting in such a virtuosity that you are getting the feeling of listening to just one voice. The group was spontaneously founded by the four women in 1995 and they immediately found a common language and interests. Thus, an unadultered atmosphere was developing at concerts and the audience often had the impression of listening to one multilayered voice. The singers are in command of a very virtuous and very impressive style of singing which is based on an excellent technique. The repertoire of the quartet comprises authentic folklore songs from different parts of Bulgaria. They are looking for the purety and primarity of the song while reading tradition in a very modern and varied way. The whole programme of the quartet contains of old Bulgarian music and church hymns as well as modern music. The quartet also plays with jazz musicians as Veselin Nikolov and Antoni Donchev and with modern composers like Krassimir Kjurkchiski. EVA Quartet also worked with: Trio Mediaeval; VeDaKi Group; Haig Yazdjian; A Filletta; Elbtonal Schlagwerk etc. The singers experiment with modern sounds like Drum´n Bass and Ambient and have already recorded a Remix. In summer 2000 they took part in the project “Magic Voices“ of the Tanz & Folklore Festival in Rudolstadt (ZDF / 3 SAT / Deutschlandfunk) which found much interest. 2002 EVA Quartet took part in a very special vocal project with the VeDaKi Group and Haig Yazdjian. 2003 they made recordings for the soundtrack of the new Polish movie “Stara Basn” / music by Krzesimir Debski. In 2003 and 2004 EVA Quartet took part in a big project of Jeunesse Vienna with Camerata Salzburg, Fanfare Ciocarlia and Muzsikas with Marta Sebestyen. * 2018 Eva Quartet start a great new project with the corsican group AFiletta. * 2014 Project “Soundcloud Linz” Johann Strauss „An der schönen, blauen Donau“ feat. Balanescu Quartet etc. * 2013 Project with Sandra Kolstad for Bergen Festival, Norway. * 2012 Project „Music from Monastery“ with Roger Willemsen, Dvuglas und Tashi Lhunpo Monastery Group from Tibet for Philharmonie, Berlin. * October 2009 togetherwork with Bea Palya (Hungary). * August 2009 participation with Trebunie Tutki (Poland) on a project for Cheslaw Niemen. * July 2009 and 2012 together working with Unni Løvlid (Norway). * May – June 2009 togetherwork with Ensemble Amarcord (Germany). * 2007 Eva Quartet took part on the Danube Music Festival in a very special project with the famous violin players Gilles Apap and Zoltan Lantos. * In summer 2007 Eva Quartet work together on a special project with Banda Adriatica.